This unique manuscript presents a novel approach to QM by modeling an elementary particle via 3D matter/energy density, which propagates in the open time-space continuum as a rest mass energy density wave packet. This simple idea is based on the fact that any macroscopic object of mass M that occupies a finite 3D volume V can be represented by an energy-density contained in V, so that the integration of this energy-density over V provides the total energy E = Mc^2 . This new theory is fully integrated with the theory of relativity, and completes the quantum theory of Einstein by overcoming the Copenhagen interpretation. The newly introduced partial differential equations describe the relativistic phenomena and, generally, the dependence of a particle’s geometrical form (its internal matter distribution) on its velocity and acceleration. A number of well-known physical principles are obtained as derived results of this theory, and are consolidated by a number of detailed examples. 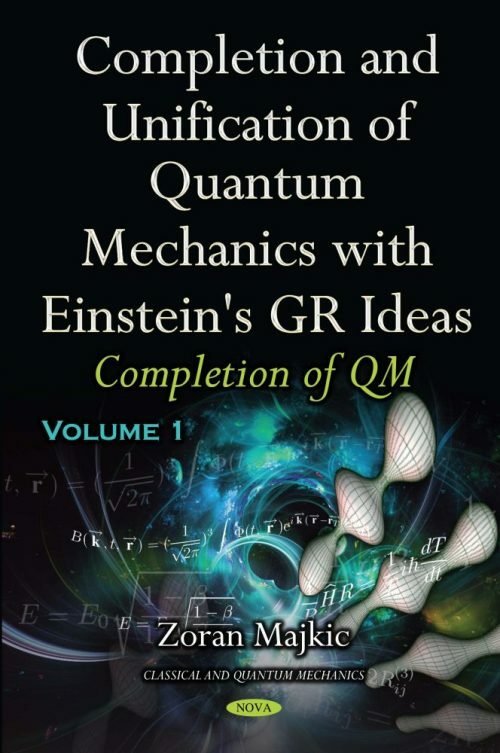 Part I, which is dedicated to the completion of QM, is composed of five Chapters. In the first two chapters, the nucleus is analyzed in terms of the material discussed. Chapter Three is dedicated to the development of the Lagrangian density for the complex wave packets of the rest mass energy density of an elementary particle, and to the new quantum field theory. The authors obtained the set of new non-Hamiltonian TSPF quantum operators, parameterized by the vector velocity field of energy density with corresponding Hilbert spaces for accelerated particles, and these were valid in any (infinitesimal) local Minkowski time-space. The main results are the new differential equations obtained as conservation laws for Noether currents and Euler-Lagrange equations, which express the exact form of the complex terms used in the differential equations in Chapters One and Two, and introduce the most useful concept of the velocity for any infinitesimal amount of the energy density flux of a particle (the hidden variables). A.Belayev, M.S.Brown, R.Foadi, and M.T.Frandsen. The technicolor Higgs in the light of LHC data. arXiv:hep-ph/1309.2097, 2013. A.Einstein. The meaning of relativity. Translation into English by Edwin P.Adams, Princenton University Press, 1922. A.Einstein,B.Podolsky, and N.Rosen. Can quantum-mechanical description of physical reality be considered complete? Phys. Rev. 47 (10), pages 777–780, 1935. A.Fine. Einstein’s interpretations of quantum theory. Translation of correspondence A.Einstein to W.Heitler, p.262, 1948. A.Fine. Locality and the Hardy theorem. in J. Butterﬁeld and C. Pagonis (eds),From Physics to Philosophy, Cambridge: Cambridge University Press., 1999. A.Ilderton, M.Lavelle, and D.McMullan. Symmetry breaking, conformal geometry and gauge invariance. Journal of Physics A: Mathematical and Theoretical, 43(31):312002, 2010. A.Kosinski. Differentiable manifolds. Academic Press, Inc., San Diego, CA, 1992. A.Noether. Invariante variationsprobleme. G¨ ottinger Nachrichten, presented by F.Klein at the meeting of 26 July 1918, pages 235–257, 1918. A.Proca. Sur la theorie ondulatorie des electrons positifs et negatifs. J.Phys. Radium 7, 347 (1936); Sur la theorie du position, C.R.Acad. Sci. Paris 202, 1366, 1936. A.Sergi and M.Ferrario. Non-Hamiltonian equations of motion with a conserved energy. Phys.Rev. E 64, 2001. A.Unzicker. The Higgs fake: how particle physicists fooled the Nobel commitee. ISBN: 1492176249, 2013. B.Bellazzini, c.Csaki, and J.Serra. Composite higgses. arXiv:hep-ph/1401.2457, 2014. B.Greene. The elegant universe: Superstrings, hidden dimensions, and the quest for the ultimate theory. Vintage Series, Random House Inc., pages 110–111, 2000. B.Grzadkowski, J.F.Gunion, and M.Toharia. Higgs-radioninterpretation of the LHC data? arXiv:hep-ph/1202.5017v2, 2012. B.L.Van’derWaerden. Sources of quantum mechanics. North-Holand, Amsterdam, 1967. L. Broglie. Recherches sur la theorie des quanta. Ann. de Phys., 10e serie, t. III (Janvier-Fervier), 1925. B.Sidharth. The thermodynamic universe. World Scientiﬁc. p. 134. ISBN 9812812342. http://books.google.com/books?id=OUfHR36wSfAC&pg=PA134], 2008. C.Csaki, C.Grojean, H.Murayama, L.Pilo, and J.Terning. Gauge theories on an interval: unitarity without a higgs boson. Physical Review D,69,5, 2004. C.Csaki, C.Grojean, L.Pilo, and J.Terning. Towards a realistic model of Higgsless elektroweak symmetry breaking. Phys. Rev. Letters, 92,10, 2004. C.Csaki, M.L.Graesser, and G.D.Kribs. Radion dynamics and electroweak physics. Physical Review D,63,6, 2001. C.G.Jacobi. Zur theorie del variationensrechnung under der differentalgleichungen. 1937. C.Liu, Z.Dutton, C.Behroozi, and L.Hau. Observation of coherent optical information storage in an atomic medium using halted light pulses. Nature 409 (6819), pages 490–493, 2001. C.N.Yang and R.Mills. Conservation of isotopic spin and isotopic gauge invariance. Physical Review 96 (1), pages 191–195, 1954. D.Bohm. A suggested interpretation of the quantum thory in terms of Hidden Variables. Physical Revie 85, 1952. D.C.Brody and E.M.Graefe. Six-dimensional space-time from quaternionic quantum mechanics. arXiv: 1105.3604v2, 06 December, pages 1–3, 2011. D.C.Brody and L.P.Hughston. Theory of quantum space-time. Proc.R.Soc.London A461 2679, 2005. D.Harrison. Complementarity and the Copenhagen interpretation of quantum mechanics. UPSCALE. Dept. of Physics, U. of Toronto. http://www.upscale.utoronto.ca/GeneralInterest/Harrison/Complementarity/ CompCopen.html., 2002. B. Diaz-Pintado and C.Maria. Updating the wave-particle duality. 15th UK and European Meeting on the Foundations of Physics, Leeds, 29-31 March, 2007. D.R.Davis. The inverse problem of the calculus of variations in higher space. Transactions of the American Mathematical Socety, 30,710, 1928. D.W.Sciama. On the origin of inertia. Monthly Notices of the Royal Astronomical Society, Vol.113, 1953. E.Adelberger, G.Dvali, and A.Gruzinov. Photon mass bound destroyed by vortices. Phys.Rev.Lett.98:010402, 2007. E.Regis. Who got Einstin’s ofﬁce. Addison-Wesley Publishing Company,MA,USA, 1987. E.Schr¨ odinger. An undulatory theory of the mechanics of atoms and molecules. Physical Review 28 (6), pages 1049–1070, 1926. F.Englert. Broken symmetry and yang-mills theory. arXiv:hep-th/0406162v2, Contribution to ’Fifty years of Yang Mills theory’, editor G.’t Hooft, World Scientiﬁc, 2004. F.W.Hehl, P. der Heyde, G.D.Kerlick, and J.M.Nester. General relativity with spin and torsion: foundations and prospects. Rev. Mod. Phys. 48, N0.3, 1976. F.W.Warner. Foundations of differentiable manifolds and Lie groups. Springer, New York, 1983. G.F.Torres’delCastillo. Differentiable manifolds-A theoretical physics approach. Springer Science, New York, NY,USA, 2010. G.Perelman. The entropy formula for the Ricci ﬂow and its geometric applications. arXiv:math.DG/0211159, 2002. G.Perelman. Finite extinction time for the solutionsto the ricci ﬂow on certain three-manifolds. arXiv:math.DG/0307245, 2003. G.Perelman. Ricci ﬂow with surgery on three-manifolds. arXiv:math.DG/0303109, 2003. G.S.Ezra. On the statistical mechanics of non-Hamiltonian systems: the generalized Liouville equation, entropy, and time-dependent metrics. J.Math. Chemistry, Vol.35, No 1, 2004. G.’tHooft. Quantum ﬁeld theory for elementary particles: Is quantum ﬁeld theory a theory? Phys.Rep., Review Section of Physics Letters 104, Nos.2-4, 1984. G.’tHooft. The mathematical basis for deterministic quantum mechanics. arXiv:quant-ph/0604008, 2006. G.’tHooft. The emergence of quantum mechanics. FFP11, Paris, ITP-UU-10/44, Spin-10/37, 2010. G.’tHooft. Hilbert space in deterministic theories. in Proc. of the 3rd Stueckelberg Workshop on Relativistic Field Theory, Cambridge Sci. Publ., 2010. G.’tHooft and M.Veltman. Regularization and renormalization of gauge ﬁelds. Nuclear Physics B 44: 189, 1972. H.A.Kramers. The law of dispersion and Bohr’s theory of spectra. Phil.Mag., 47, 1924. H.Davoudiasl, J.L.Hewett, B.Lillie, and T.G.Rizzo. Warped Higgsles models with ir-brane kinetic terms. arXiv:hep-ph/0403300, 2004. H.Minkowski. Raum und zeit. Jahresberichte der Deutschen MathematikerVereinigung, transl.F.Lewertoff and V.Petkov, 2012, Minkowski Institute Press, Montreal, CA, pages 75–88, 1909. H.Poincare. Sur la dynamique de l’electron. Rendiconti del Circolo matematico di Palermo 21, pages 129–176, 1906. H.Pulte. L’ottocento: matmatica. mechanica analitica. Enciclopedia, L’ Ottocento Matmatica Meccanica Analitica in Storia della Scienza, Treccani, 2003. H.Weyl. Gravitation and electrizit¨ at. Sitzungsber. Akademie der Wissenschaften Berlin. Englishtranslationin L.O’Raifeartaigh,The dawning of Gauge Theoty, Princenton Univ. Press, 1918. H.Weyl. Elektron and gravitation. I.Z.Phys. 56, 330, 1929. H.Yukawa. On the interaction of elementary particles. Proc. Phys.-Math. Soc., 17, pages 48–57, 1935. I.M.Gelfand and N.Y.Vilenkin. Generalized functions. Vol. IV, Accademic Press, New York, 1964. I.Schmelzer. Why the Hamilton operator alone is not enough. arXiv:0901.3262, 2009. J. D. Jackson. Classical electrodynamics. (3rd ed.). Wiley, 1998. J.A.Wheeler. Geons. Phys. Rev. 97, 511, 1955. J.C.Slatter. Quantum theory of matter. McGraw-Hill Book Company, New York, 1968. J.D.Ramshaw. Remarks on non-Hamiltonian statistical mechanics. Europhys.Lett. 59, pages 319–323, 2002. J.Goldstone. Field theories with superconductor solutions. Nuovo Cimento 19, pages 154–164, 1961. J.Goldstone, A.Salam, and S.Weinberg. Broken symmetries. Phys. Rev., 127, pages 965–970, 1962. J.Liouville. Sur la theorie de la variation des constants arbitraires. J.Math. Pures Appl. 3, pages 342–349, 1838. J.L.Lagrange. Mechanique analytique (1788). reprinted by Gauthler-Villaris, Paris, 1888. J.S.Bell. On the Einstein Podolsky Rosen paradox. Physics 1(3), pages 195–200, 1964. J.W.Gibbs. Elementary principles in statistical mechanics. Yale University Press, New Haven, 1902. K.G.Zloshchastiev. Spontaneous symmetry breaking and mass generation as built-in phenomena in logaritmic nonlinear quantum theory. arXiv:hep-ph/0912.4139v5, 2011. L.Faddeev. An alternative interpretation of the Weiberg-Salam model. arXiv:0811.3311v2 [hep-th], 2008. L.G.Sapogin and Y.A.Ryabov. New theoretical results about the mass spectrum of elementary particles. Applied Physics Research, Vol.2, No.1, 2010. L.G.Sapogin, Y.A.Ryabov, and V.A.Boichenko. The Unitary Quantum Theory and nwe sources of energy. Science Publishing Group, New York, ISBN:978-1-94036643-2, 2015. L.Hau, S.Harris, Z.Dutton, and C.Behroozi. Light speed reduction to 17 metres per second in an ultracold atomic gas. Nature 397, pages 594–598, 1999. L.Schwartz. Theory of distributions. Hermann, Paris, 1950. L.Smolin. The trouble with physics: The rise of string theory, the fall of a science, and what comes next. Houghton Mifﬂin. ISBN 978-0-618-55105-7, 2006. M.Born. The statistical interpretation of quantum mechanics. Nobel Lecture, December 11, 1954. M.Carena, C.Grojean, M.Kado, and V.Sharma. Status of Higgs boson physics. The Review of Particle Physics, PDG, 2013. M.E.Tuckerman, C.J.Mundy, and M.L.Klein. On the classical statistical mechanics of non-Hamiltonian systems. Europhys.Lett. 45, pages 149–155, 1999. M.Fairbairn and R.Hogan. Elecrtoweak vacuum stability in light of BICEP-2. Phys. Rev. Lett. 112, and arXiv:hep-ph/1403.6786v3, 2014. M.Jammer. Concepts of mass in classical and modern physics. Harvard University Press, 1961. M.Jammer. The conceptul development of quantum mechanics. McGraw-Hill, 1966. M.N.Chernodub, L.Faddeev, and A.J.Niemi. Non-abelian supercurrents and de sitter ground state in electroweak theory. arXiv:0804.1544v2 [hep-th], 2008. M.Pawlowski and R.Raczka. A uniﬁed conformal model for fundamental interactions without dynamical Higgs ﬁeld. arXiv:hep-th/9407137v1,1994. M.Strassler. Matter and energy: a false dichotomy. athttp://profmattstrassler.com/articles-and-posts/particle-physics-basics/, 2012. N.Bohr. On the quantum theory of line-spectra. Kgl. Danske Vid. Selsk. Skr., natmath. Afd., 8, 1918. N.Bohr, J.A.Wheeler, and W.H.Zurek. Quantum theory and measurement. Princeton, pages 9–49, 1983. J. Neumann. Mathematical foundations of quantum mechanics. Princeton, Princeton University Press. Translated (1955) by Robert T. Beyer, 1932. J. Neumann. Mathematische grundlagen der quantenmechanik. Springer, Berlin, 1932. O.Donati, G.F.Missiroli, and G.Pozzi. An experiment on electron interference. American Journal of Physics 41, pages 639–644, 1973. P.A.M.Dirac. The principles of quantum mechanics. Fourth Edition, Oxford University Press, 1958. P.A.Schilpp. Albert Einstein-philosopher scientist. 2nd ed. New York: Tudor Publishing, 1951. P.C.W.Davis and J.Brown. Superstrings, a theory of everithing? Cambridge University Press, ISBN 0-521-35741-1, 1988. R. Penrose and W.Rindler. Spinors and space-time. vol.1 (Cambridge: Cambridge University Press), 1984. P.Gibs. Is the speed of light constant? in Carlip, S. Usenet Physics FAQ. University of California, Riverside. http://math.ucr.edu/home/baez/physics/Relativity/SpeedOfLight/speed of light.html, 1997. P.Woit. Not even wrong: The failure of string theory and the search for unity in physical law. Basic Books. ISBN 978-0-465-09275-8, 2006. R.A.Treumann, R.Nakamura, and W.Baumjohann. Relativistic transformation of phase-space distributions. arXiv: 1105.2120v2, 19 Jul, 2011. R.Barbieri, A.Pomarol, and R.Rattazzi. Weakly coupled higgsless theories and precision electroweak tests. arXiv:hep-ph/0310285,2003. R.B.Salgado. Visualiing proper-time in special relativity. arXiv: 0505134v1, 19 May, 2005. R.Feynman, R.Leighton, and M.Sands. The Feynman lectures on physics. Addison Wesley, Reading, Vol. III, 1965. R.Hamilton. Three-manifolds with positive Ricci curvature. Journal of Differential Geometry, vol.17, n.2, pages 255–306, 1982. R.M.Santilli. Foundations of theoretical mechanics, Vol. I: The inverse problem in Newtonian mechanics. Springer-Verlag, Heidelberg-New York, 1978. R.M.Santilli. Hadronic mathematics, mechanics and chemistry, Vol. I: Limitations of Einstein’s special and general relativities, quantum mechanics and quantum chemistry. Publisher: International Academic Press, 2008. R.Penrose. The road to reality: a complte guide to the laws of the universe. Knopf., ISBN 0-679-45443-8, 2005. R.P.Feynman. Qed: The strange theory of light and matter. Princeton University Press, New Jersey, 1985. S.Bilson-Thompson, F.Markopoulou, and L.Smolin. Quantum gravity and the standard model. arXiv:hep-th/0603022v2,2007. S.L.Glashow. NOVA- The elegant universe. PBS.org. Retrieved on 2012-07-11, 2012. S.Weinberg. The quantum theory of ﬁelds II, modern applications. Cambridge University Pres, 1996. T.G.Rizzo. Introduction to extra dimensions. arXiv:hep-ph/1003.1698, 2010. T.Masson and J.C.Wallet. A remark on the spontaneous symmetry breaking mechanism in the standard model. arXiv:1001.1176v1 [hep-th], 2010. V.A.Zorich. Mathematical analisys II. Springer, Berlin, 2004. V.E.Tarasov. Stationary solutions of liouville equations for non-Hamiltonian systems. Annals of Physics 316, Elsevier, pages 393–413, 2005. W.Heisenberg. ¨ Uber der quantentheoretische umdeutung kinematischer und mechanischer beziehungen. Z.Phys., 33, 1925. W.R.Hamilton. On a general method in dynamics (1834). reprinted in Hamilton’s Collected Woirks, Cambridge University Press, 1940. W.Struyve. Gauge invariant accounts of the Higgs mechanism. Studies in History and Philosophy of Science, Part B 42(4), pages 226–236, 2011. Y.Kametaka. Korteweg-de Vries equation. I. Global existence of smooth solutions. Proc. Japan Acad., 45, 1969. Z.Majkic´. Complex wave packets for elementary particles in the Minkowski 4-dimensional spaces. Technical Report 04-10, Compet Research, http://zoranmajkic.webs.com, 2010. Z.Majkic´. Energy and special relativity effects for wave packets in the Minkowski 4-dimensional spaces. Technical Report 03-10, Compet Research, http://zoranmajkic.webs.com, 2010. Z.Majkic´. Lagrangian for elementary massless particles in the Minkowski 4-dimensional spaces. Technical Report 05-10, Compet Research, http://zoranmajkic.webs.com, 2010. Z.Majkic´. Double-split experiment and wave packets for elementary particles in the Minkowski spaces. Technical Report 04A-11, Compet Research, http://zoranmajkic.webs.com, 2011. Z.Majkic´. Partial differential equations for wave packets in the Minkowski 4-dimensional spaces. E-Journal Differential Equations and Control Processes, N.1 February 2011, Publisher: Mathematics and Mechanics Faculty of Saint-Petersburg State University, Russia, http://www.math.spbu.ru/diffjournal/pdf/madjkic.pdf,2011. Z.Majkic´. Schr¨odinger equation and wave packets for elementary particles in the Minkowski spaces. E-Journal Differential Equations and Control Processes, N.3 July 2011, Publisher: Mathematics and Mechanics Facultyof Saint-PetersburgState University, Russia, http://www.math.spbu.ru/diffjournal/pdf/madjkic2.pdf, 2011. Z.Majkic´. Differential equations for elementary particles: Beyond duality. LAP LAMBERT Academic Publishing, Saarbr¨ ucken, Germany, 2013. Z.Majkic´. Big data integration theory. Texts in Computer Science, Springer Int. Pub. Co.,Switzerland, 2014.